Briar Chapel newsletters will give you an idea of what it is like to live in Briar Chapel. 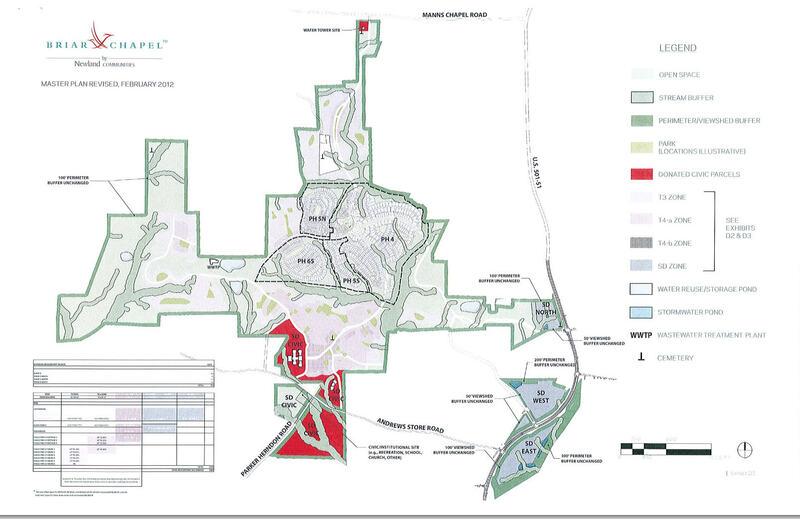 Briar Chapel is almost 1600 acres with 2400 homes planned and 900 acres of open space. There will be 24 miles of trails when complete. There are about 20 miles of mountain bike and walking trails now. Depending on the real estate market the neighborhood will likely be built out sometime in 2020. There were over 300 homes sold in Briar Chapel in 2017, 3/4 were new homes. I’ve been bringing clients to Briar Chapel since the neighborhood first opened because there just isn’t anything like it in the Triangle. Several things set the neighborhood apart from others. Is Briar Chapel for you? There a few reasons the neighborhood may not be a perfect fit. First is location. There just aren’t many new homes in Chapel Hill and it is great to have new home inventory to show. There are 5 builders and they are good. They range from national and regional builders to small custom builders. Price ranges from the low 300’s to 900’s .I think a neighborhood with competing builders keeps the designs and details fresh. Competition is good. The neighborhood is certified 3rd party green, both homes and amenities. The clubhouse is LEED gold certified. The National Green Building Standard (NGBS) is a program that certifies homes depending on the points received for green building practices. Briar Chapel builders must meet at a minimum the Bronze level of the National Green Building Standard (NGBS) . These building guidelines are given to the builders to follow. Incredible amenities. The salt water pools with huge water slide, trails, parks, schools, clubhouse, activities director and events. The schools are very good with a middle and charter school in the neighborhood and a elementary school scheduled to open in 2020. Varied demographics because of the different home styles and prices. At least for now it’s not a walkable neighborhood. Shopping and things to do are close by but you will need a car. You could easily bike to Fearrington Village but would have to cross a busy road. There is a light. It’s 15-20 minutes to Whole Foods but there is a Harris Teeter about a mile from the entrance. Did I mention that the entry parkway is almost 2 miles long? The lots are very small. Some back to woods but the lot size just won’t do for some. It is a trade off to get the new house. There will be construction going on for a long time. When you move you will be competing with new homes if you are going to stay in your home for around 2.5 years you should be in good schape as development will be done. The good news is that homes have been appreciating even during the downturn when the neighborhood was just starting. There are separate construction entrances and development is in phases and goes fast. There isn’t public transportation. There is a park and ride in Southern Village but that’s 10 minutes down 15-501. Briar Chapel in Chapel Hill, NC is a large mixed use neighborhood in Chatham County, NC (Chapel Hill address). It’s one of the best new neighborhoods because of the location, builders, prices and amenities. It’s a straight shot of around 7 miles down 15-501 to UNC Chapel Hill on a 4 lane road so it is a quick easy commute. 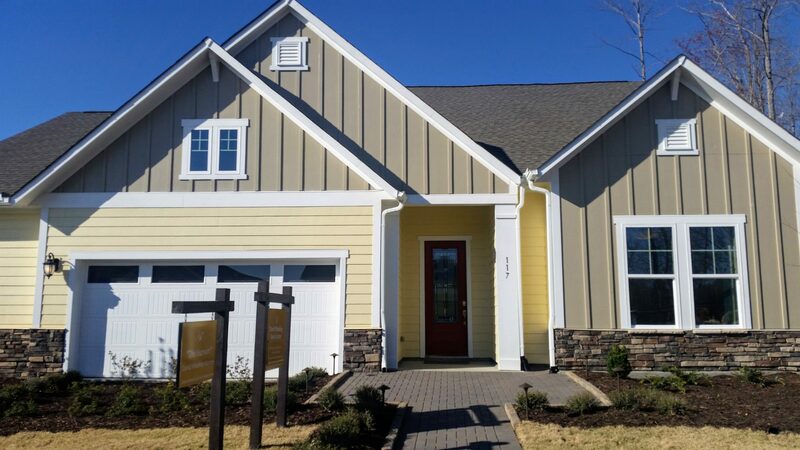 The prices for new homes In Briar Chapel are the best in the area and I really like that the amenities are in and that the neighborhood is well maintained. The first buyers in a neighborhood get the best prices but have a greater risk that the neighborhood won’t be developed as planned. I feel good when there are signs that the developer has deep pockets and will be around for the long haul. The Developer is Newland and here is a link to their site. The University of North Carolina is 8 miles and Duke University is 20 miles. RDU Airport is 25 miles. The average sales price in Briar Chapel is around $360,000. Price per sq ft. ranges from around 150 sq. ft. to over $200 sq ft. I’ve represented buyers in all price ranges. One thing to keep in mind is different builders have different pricing structures so you can’t go by base prices. There are usually lot premiums and structural and design center options. Garages can be attached or detached.The best way to tell true pricing is to look at the inventory (move in ready pricing). If the home has started the lot premiums and options are usually included. Saussy Burbank is one of my favorite builders because the houses are well done and ready for the walk through. 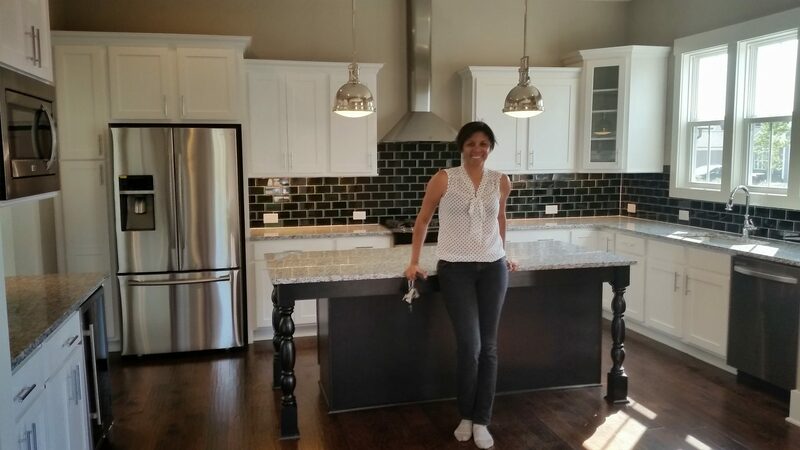 Here is a client showing off their new kitchen. They are a true custom builder and will build your home however you want as long as it meets the neighborhood architectural review. Homes by Dickerson builds a classic home with all of the latest updates without being too trendy. Update December 2017!! Yikes, see below, the plan I loved in 2013 is about 100K more expensive! Still, the Briar Chapel prices are about as good as it gets in the Chapel Hill/Cary/Apex area for the build quality and amenities. September 2013- Next we went to the new Homes by Dickerson model. (It’s sold now along with just about all of their inventory homes. They have a lot under construction for Spring 2013 completion) I fell in love with one of their plans in Briar Chapel during the Parade of Homes in October and was looking forward to seeing their new model for the smaller homes. I’m sort of stuck on white cabinets now with a light top and a plain light backsplash and their designer is great with this look although they do darker cabinets and tops too. Their model is 2,004 sq ft and is $333,185. What I loved about this plan is the first floor master bedroom and the upstairs open family room area with 2 bedrooms and a bath opening from it. There are two big areas for walk in storage. Homes by Dickerson have site finished floors and especially nice and interesting trim details. I have worked with David Weekley Homes for years and know they build a good energy efficient home. Their plans are excellent and you get a good price along with the good plan. The features are really nice too. I especially like the customer service and how they are so proud of their homes. I’m excited to hear that in fall of 2018 they will have some new lots in Briar Chapel with larger lots and 3 car garages. Encore is a neighborhood within Briar Chapel by David Weekley Homes for over age 55 buyers. The floorplans are open and bright. There is a separate clubhouse and pool for this neighborhood and other Briar Chapel amenities are shared with the neighborhood. Prices start around $400,000 with lot premiums and some design center options. Garman has been building in the neighborhood for a couple of years and they have their own style. They are also a local builder with their main office in Cary. My clients who have built with them have been very happy. They have an interesting concept for one of their home collections. They make buying simple by having pre selected packages for each home plan. There is a beautifully designed package for each of the most popular design styles so you just pick your home plan and then choose your style package. It’s easy and more efficient for the builder too and that’s reflected in the prices. You can get a 3 bedroom home with attached garage for under $400,000. If a detached garage or no garage works for you the prices can even be in the upper 200’s for the Fresh Paint collection! If you would rather choose all of your finishes yourself, Garman has a really nice design center with designers to help. New construction is my speciality. Although, I can show you or help you buy any resale home on the market. It’s always good to compare. Let me know if you would like more information or would like to visit Briar Chapel. Or, if you would like me to represent you as your Buyers Agent. Why do you need a Buyers Agent for new construction? Here are some of the reasons. I’ll get back out to Briar Chapel again soon and do a video update.